It's Galaxy Note! You don't say. Reports suggest that the Android Ice Cream Sandwich update is finally making its way onto Samsung Galaxy Note handsets. Samsung hasn't been the quickest at getting the ICS update out to its customers, with many users frustrated over the time it took for the Galaxy S2 version to appear. The next comes via a tweet from Devin Balentina, who posted a screenshot of the ICS update notification on his Galaxy Note. As well as the obligatory Android 4.0 additions, the new update for the Galaxy Note will also see some new tweaks to the TouchWiz 4.0 overlay along with some new applications. Among the new features are the S Pen-optimised S Note and My Story apps. 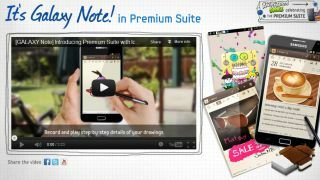 S Note allows users to combine their sketches and notes with other digital content, while My Story provides users with a way to create personalised digital cards. You can check out all these fancy new features in the handy video Samsung has put together below. We contacted Samsung which said: "Samsung UK will confirm details regarding the Android 4.0 Ice Cream Sandwich update for Galaxy Note in due course." - so there's no guarantee you'll see the update today, and we're not even going to get STARTED on the fact that network's optimisation could delay the process further.